Lately I have been quite fond of eating Bak Kut Teh, a herbal soup with pork parts (predominantly ribs). 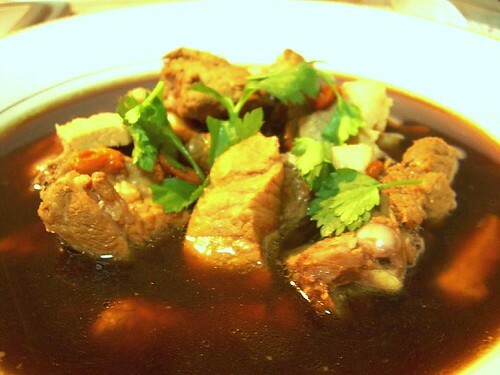 Bak Kut Teh is transliterated to the Hokkien / Eng Choon dialect as “Pork Rib Tea”. All these while, I would buy Bak Kut Teh from a nearby stall and have it for dinner with steaming white rice. That was until the thought of cooking it myself came about when I popped by at a Chinese herbal medicine shop. I wanted to see if I could replicate it at home. Ready made Bak Kut Teh herb sachet are commonly found in supermarkets and grocery shops and the different brands available can be quite mind-boggling. We bought ours called the Chat Lin Brand, manufactured in Semenyih, Malaysia. So, last Saturday morning, I went to get myself about 700 grammes of pork ribs and loin and the experiment began. The recipe was simple and easy to follow, though I did add the seasoning to my personal taste. I also added some Goji berries to sweeten the soup. The end result was a satisfying dinner for the family and I am looking forward to cooking the other sachet soon. There are 2 sachets of about 8 grammes each in a packet. Bring a pot of water to boil and add pork ribs and loin. Allow to boil for 3 minutes. Remove ribs and loin and pour away the water. Bring to boil the 5 rice bowls of water. Add ribs and loin, herbs and seasoning and allow to boil for 5 minutes. Remove loin and set aside whilst leaving the rest of the ingredients to stew in medium low heat for 30 minutes. Cut loin into small pieces and put it back into the soup just before serving. Dish up and serve hot with steaming white or oily rice (rice mixed with fried shallots). You might also want to add button / shiitake mushrooms and / or fried puffy beancurd (tau pok) into the soup during the cooking process and serve together with yau char kueh (fried cruellers). Read my review on Klang Bak Kut Teh. tigerfish : This is one of those clear peppery BKT. The ones in Klang (where it originates from) can be quite thick and herbal in taste, but absolutely delicious! Nothing quite like the original BKT. But something is better tahn nothing aight?! There’s one called Claypot manufactured by Jaster foods which is not bad. Yummy! Hi! I love BKT as well. I place your BKT picture and link on my blog. Hope you don’t mind. Thank you. ophoeng : Thanks. I am okay with the link. I love Bak Kut Teh. Recently, I was in Singapore for the Singapore Air Show 08 and found NG AH SIO PORK RIBS SOUP EATING HOUSE at 208 Rangoon Road singapore 218453. Tel 6294 7545 open 6am-2pm everyday,but Monday. They also have the Bak Kut Teh herb sachet you can purchase. I did and now have a stash until the next trip. If in Singapore and you have time, I highly recommend this place for breakfast or lunch. Bak Kut Teh will shake almost any hangover too. Hey, do you have any idea how to make the oily rice for ba ku teh.